We will have a Header Banner Contest. The winning Banner will be the Header Banner of our forum, and whoever is the maker of that banner will get extra credits which he/she could use in the upcoming Projects. 1. The Banner must have all the WB ORIGINAL PAIRING…(now that depends on you if you guys like G-YE/Heedragon, SUntae/Taehee as the original pairing…since they’re the only ones that has different pairings from their special stages). 2.The size of it could range from 700 x 200 to 900 x 300 pixels. 3.The deadline of entries will be on Nov. 9,2008 at exactly 5 pm. 4.From those entries we will have a poll for the other FAM members to decide which work they think is the best. So the winner would be picked in this manner, 50% from polls & 50% from the Admin’s group judgement. 6.A member can only have one entry, so be sure that you give it your all. This entry was posted on November 1, 2008 by toobinluv. 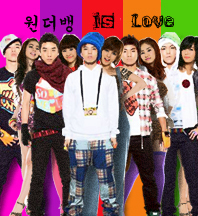 It was filed under Forum/Fan Club, WB News and was tagged with banner, big bang, contest, forum, wonder girls, wonderbang.